Hiker-dog seemed to appreciate the beauty of rocky cascades above Mina Sauk Falls. Hiker-dog and I camped on top of Taum Sauk Mountain with the plan to hike the Mina Sauk Falls Trail early. It was a cool night at 27-degrees. We rose early, excited to hike a loop trail that includes the high-point of Missouri. 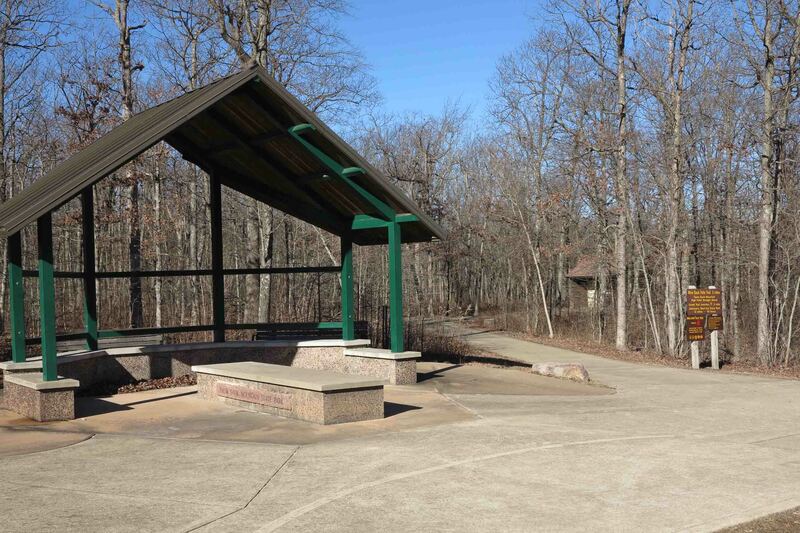 The section of trail to the high point of Missouri is paved and handicapped accessible. Beyond that, the trail turns to dirt and rocky paths. The Missouri high point at 1,772 feet reminded me of Arkansas’ high point on Mount Magazine (2,753 feet). Hardwood forests surround both high points rather than expansive vistas. The impressive views from these mountains are closer to the mountain ridges at lower elevations. You’ll see a commemorative plaque and a trail register to document your visit. Be sure to step up onto the boulder so you’re officially at the highest point possible. There are several nice overlooks along this loop trail. Paths through lichen-covered rocky sections are marked with trail posts and orange arrows. Water twists its way down toward Mina Sauk Falls. As you begin to hear the water flowing, the trail intersects with the Ozark Trail. Hiking down the rocky Ozark Trail about a tenth of a mile takes you to the base of the Mina Sauk Falls. It’s worth the side-trip! A Native American legend tells how the Mina Sauk Falls were named. The version linked here was printed in the Southeast Missourian in 1935. It could be called a Missouri Ozarks version of the Romeo and Juliet story. Spend some time at the base of Mina Sauk Falls, beautiful even when water flow is subdued. Imagine Mina Sauk of the Sauk-ton-qua tribe leaping to her death over these falls, enraged over the unfair death of her Osage warrior love. After enjoying the falls, we climbed back up to the junction and continued along the creek on this loop trail. We couldn’t resist a second look at Missouri’s high point as we neared the trailhead. On the last section of this loop, we encountered the same two hikers we’d met the day before at Maramec Spring. I thanked them for recommending the walk down Maramec Branch to the bridge. We’d only met two other hikers on the trail on this cold morning, so I chalked this up as another “small world” experience. As we walked to the Jeep passed the sheltered trailhead, I thought about the crowds that must flock to this location during the warmer months. We like Taum Sauk Mountain in winter! This entry was tagged Mina Sauk Falls, Missouri high point, Ozark Trail, Southeast Missourian, Taum Sauk Mountain, Taum Sauk Mountain State Park. Bookmark the permalink.